Prepositions of Place: “next to” or “behind”? I'm a non-native teacher of English and I work with adults. "The sink is next to the toilet"
"The sink is behind the toilet"
I feel we should use "next to" because the toilet doesn't cover the front side of the sink and some of my students agreed with me. That very student, however, is an engineer and he sees geometry everywhere. He said that if a person was standing on the rug they would see the toilet covering the most part of the sink, so "The sink is behind the toilet". Now I'm pretty confused. Which preposition would you use and why? Bathrooms are laid out with toilets against a wall. Always. Unless you are a king and have a toilet in the middle of the room. Very unusual, to say the least. Therefore, nothing can ever be "behind" a toilet. The front and the back of a toilet are "set things". They don't change depending on your point of view. When any built structure has items up against a wall like a toilet, there is a front (where your feet go) and a back to the toilet that is up against the wall. The back of the element is against a wall (sink and toilet) and the front sides face outwards. This is pretty much standard in the Western world. Even if there is a partially obstructed view, one would not say the toilet is behind the sink. The toilet and sink in the picture are next to each other. So, teacher, you were right and your student was mistaken. And I believe this is probably the same thing in most languages. Conventionally you'd describe the fixtures in the bath from a point-of-view facing them. So the sink is next to or to the left of the toilet. 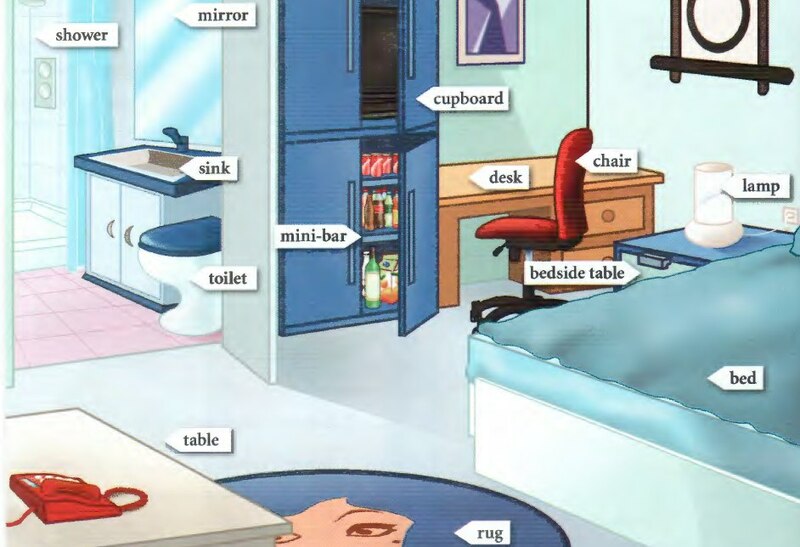 In the sketch, which shows the room from the doorway, from a vantage-point outside the room, the sink is behind the toilet—but only from that vantage point. From a point-of-view of someone seated on the toilet, the sink is to the right of the toilet. But that is not the conventional point-of-view. 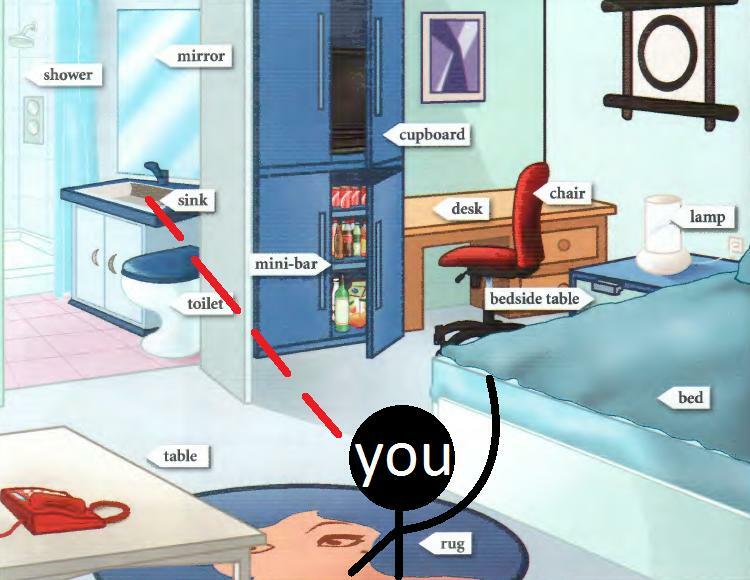 Prepositions of place are not determined by where the viewer is, because that would simply lead to confusion from a multiplicity of subjective points of view. Imagine if there were 5 people sitting in the room, each with a different angle of view to the bathroom. The location of the sink relative to the toilet would be different for each person. This would be a clumsy way to describe spatial relationships, and so it is standard to describe the locations of objects relative to each other. The side of the sink is adjacent to the side of the toilet. Therefore, the sink is next to the toilet. Not the answer you're looking for? Browse other questions tagged prepositions usage or ask your own question. What's the difference in using prepositions of place?